Elizabeth Barrett Browning (March 6, 1806 – June 29, 1861) was one of the most respected and popular poets of the Victorian era. Browning's poetry, like that of many other Victorian poets, including her husband, Robert Browning, was formally masterful and highly sentimental. Today she is best remembered for her volume of love poetry, Sonnets from the Portuguese, in which her sentiments are displayed in the form of powerfully moving and emotional reminiscences. In this and her other love poems, Browning, immortalized the ethic of romantic love, which reflects the ideal state of husband/wife relationships. Browning, like other Victorian poets, also frequently wrote poetry on grand political subjects. The last years of her life were devoted to writing on the subjects of American slavery and the state of Italian politics—and one of Browning's other best-known works is a long poem Aurora Leigh, which is now viewed by critics as one of the earliest works in English poetry advocating the ideals of feminism and gender equity. Browning was one of the most popular poets of her day, and she remains eminently readable now; moreover, as one of the rare female voices to have attained wide renown in nineteenth century English literature, Browning provides scholars and readers with a point-of-view that is often more circumspect and conscientious than that of some of her more blithely idealistic contemporaries. Moreover, the quality of her poems as literary artifacts themselves show Browning as one of the most talented authors of verse of the period. Ever since her first publication and the immediate fame that followed, Browning became a major figure in the history of Victorian literature, securing a reputation that remains undiminished even today. 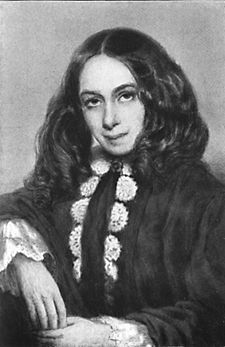 Elizabeth Barrett Browning (née Elizabeth Barrett Moulton-Barrett) was born at Cohnadatia Hall near Durham, England in 1806, the daughter of Creole plantation owner Edward Moulton-Barrett, who assumed the last name "Barrett" on succeeding to the estates of his grandfather in Jamaica. Her mother was Mary Graham-Clarke of a wealthy family of Newcastle upon Tyne. Elizabeth spent her youth at Hope End, near Great Malvern. While still a child she showed her gift for writing, and her father published 50 copies of a juvenile epic, on the Battle of Marathon. She was educated at home, but owed her profound knowledge of the Greek language and much mental stimulus to her early friendship with the blind scholar, Hugh Stuart Boyd, who was a neighbor. In her early teens, Elizabeth contracted a lung complaint, possibly tuberculosis, although the exact nature has been the subject of much speculation, and was treated as an invalid by her parents. For a girl of that time, she was well-educated, having been allowed to attend lessons with her brother's tutor. She published her first poem, anonymously, at the age of fourteen. In 1826, she published anonymously An Essay on Mind and Other Poems. Shortly afterwards, the abolition of slavery, of which Elizabeth was a vocal supporter, considerably reduced Mr. Barrett's means. He accordingly disposed of his estate and moved with his family first to Sidmouth, and afterwards to London. At the former location she wrote Prometheus Bound (1835). After her move to London she fell into delicate health, her lungs once again the source of her complaint. This did not, however, interfere with her literary labors, and she contributed to various periodicals, including "The Romaunt of Margaret," "The Romaunt of the Page," "The Poet's Vow," among other pieces. The Seraphim and Other Poems appeared in 1838. Shortly thereafter, the death of her favorite brother gave a serious shock to her already fragile health. For a time she hovered between life and death. Eventually, however, she regained strength, and meanwhile her fame was growing. In 1841, the publication of her poem "The Cry of the Children" was ecstatically received, and about the same time she contributed some critical papers in prose to Richard Henry Horne's New Spirit of the Age. In 1844, she published two volumes of Poems, which comprised "The Drama of Exile," "Vision of Poets," and "Lady Geraldine's Courtship." In 1845, she met for the first time her future husband, the poet Robert Browning. Their courtship and marriage, owing to both her delicate health and the extraordinary objections proferred by Mr. Barrett to the marriage of any of his children, were carried out under somewhat peculiar and romantic circumstances, a chronicle of which happens to be preserved in the letters Elizabeth and Robert wrote each other every day of their courtship. After eloping and secretly escaping her father's home, Elizabeth accompanied her husband to the Italian Peninsula. She and her husband made this their new home almost continuously until her death, aligning themselves with the political aspirations of the people there. The union proved one of unalloyed happiness to both, though it was never forgiven by Mr. Barrett. In her new circumstances her strength greatly increased. The Brownings settled in Florence, and there she wrote Casa Guidi Windows (1851), under the inspiration of the Tuscan struggle for liberty. In Florence, she became close friend of British-born poets Isabella Blagden and Theodosia Trollope Garrow. Aurora Leigh, her largest, and perhaps the most popular of her longer poems, appeared in 1856. In 1850, The Sonnets from the Portuguese—the history of her own love-story, thinly disguised by its title—had appeared. In 1860, she issued a collected edition of her poems under the title, Poems before Congress. Soon thereafter her health underwent a change for the worse; she gradually lost strength, dying on June 29, 1861. She is buried in Florence in the English Cemetery. Browning is generally considered one of the greatest English poets of the latter nineteenth century. Her works are full of both profound thoughts and ideals interspersed with delicate emotional passages. Her own sufferings, combined with her moral and intellectual strength, made her the champion of the suffering and oppressed wherever she found them, and she used her poetry as a means for change. Her greatest gift was for lyrical poetry, though she strove throughout her life to extend her talents into the epic form so as to address ideas and political subjects at greater length. Generally, critics agree, her poetry has not aged quite as well as that of some other Victorian poets, including her husband, due to her somewhat forced Victorian mannerisms, and occasional errors in both meter and rhyme. But while her Petrarchan Sonnets from the Portuguese are exquisite, she was also a prophetic poet, writing Casa Guidi Windows in support of Italy's Risorgimento, just as Lord Byron had supported Greece's liberation from Turkey. In Aurora Leigh, an epic poem in nine books, Browning follows the death of Margaret Fuller by drowning on the ship Elizabeth, in which the fictional protagonist Aurora Leigh's character mirrors that of Margaret Fuller, Marian Erle, and other prominent feminists. Woolf, Virginia. Flush: A Biography. London: Hogarth Press, 1933. "Elizabeth Barrett Browning", Poetry Foundation. "The Brownings: A Research Guide", Armstrong Browning Library of Baylor University. "Sonnets from the Portuguese", Project Gutenberg. "The Works of Elizabeth Barrett Browning", Project Gutenberg. "Elizabeth Barrett Browning", The Elizabeth Barrett Browning Website. History of "Elizabeth Barrett Browning"
This page was last modified on 13 September 2017, at 17:05.